Dr. Erickson presenting an overview of the history of JCVI’s Mycoplasma research and her work on the Mycoplasma gallisepticum to the Salisbury University group touring JCVI Rockville. 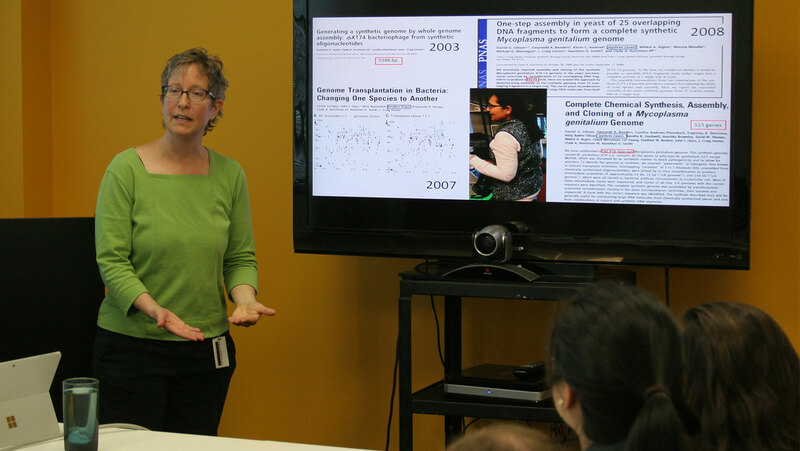 Patti Erickson, PhD first connected with the J. Craig Venter Institute (JCVI) in the Fall of 2016 as an associate professor at Salisbury University looking for opportunities to expose undergraduate students to biology outside of the classroom. Soon thereafter, she and a group from Salisbury visited JCVI’s Rockville labs, forging a relationship that would lead her to working in the lab of Sanjay Vashee, PhD as a visiting scientist while on sabbatical. Her work at JCVI, which is ongoing, is focused on using synthetic biology techniques developed at JCVI to generate partial genomic hybrids of Mycoplasma gallisepticum to facilitate functional analysis of this important poultry pathogen. Serendipitously, Salisbury University is located on the Eastern Shore of Maryland, known for its large-scale chicken breeding and home to Perdue Farms. This past month Dr. Erickson and Salisbury students traveled to San Diego to attend the annual American Society for Biochemistry and Molecular Biology (ASBMB) meeting, held in conjunction with the Experimental Biology conference. There, she presented her work involving C. elegans, done while working in the Hawdon Lab at George Washington University, and Salisbury students presented posters on independent research projects. While in the San Diego area, the group was able to visit JCVI’s La Jolla campus, where they were hosted by Gene Tan, PhD. They visited with leading synthetic biology experts including John Glass, PhD, who gave an overview of the minimal cell project, followed by Nobel Laureate Hamilton Smith, MD and Clyde Hutchison, PhD. They also toured the facility, which is an ultra-energy efficient laboratory. Salisbury University students and faculty, and J. Craig Venter Institute staff gather at the end of the day's activities at JCVI’s Rockville location. Salisbury students and faculty again visited JCVI Rockville this past week for a full day of lectures and demonstrations. JCVI’s Stephanie Mounaud presented on an infant microbiome project; David Haft presented on hidden Markov modeling approaches; and Dr. Erickson gave an overview of JCVI’s Mycoplasma research and how her work on the M. gallisepticum genome hybrids fits into it. Students from Salisbury University tour JCVI's Rockville lab. Left: Dr. Chandran shows the group mammalian cell lines. Right: Dr. Yu discusses mass spectroscopy. Other scientists led a lab tour, including Yanbao Yu, PhD, who explained how mass spectroscopy can be used to identify and sort peptides for proteomics studies. Agnes Chan, PhD showed the group the MinIon nanopore sequencer and discussed forthcoming technologies that will make sequencing financially feasible at smaller universities. Suchismita Chandran, PhD discussed the importance of mammalian tissue cultures for studying viruses and showed the group several cell lines, while Bryan Frank discussed the airplane microbiome project. The visit culminated with Nacyra Assad-Garcia describing the challenges of transplanting entire Mycoplasma genomes. The visits were organized by JCVI’s education manager, Sarah Grimshaw. Educational outreach and community engagement are part of JCVI’s core mission. JCVI is committed to enhancing scientific literacy, increasing enthusiasm in science, and developing the next generation of genetic and genomic scientists. To learn more, visit JCVI’s Educational Outreach page.